A finely powdered mineral. A must for the serious flier. Administer in gallipot or very small grit bowl three weeks before training begins and throughout the old and youngbird racing season. A nutritive and energy source which feeds the muscles and helps the racers banish fatigue. The most powerful rebuilder (grape sugar base) for the racers after exertion. Use day of shipping and race day upon return. Recommended use: 1 tablespoon per gallon of water. The winning edge that we all are looking for. Improves the development of strength, size, stamina and speed in the birds. Reduces fatigue and accelerates recovery and recuperation. All natural ingredients: minerals, vitamins, herbs, amino acids, proteins, carbohydrates. Recommended use: 1 tablet per bird on each of the seven days prior to first race. We also give 1 Performance Pill along with the Vita King Ideala pills to our youngsters starting at 14 days old until weaned. Concentrated combination of Probiotics (helpful bacteria builder), electrolytes, amino acids and vitamins. Formulated to rebound birds from periods of extreme stress and illness. Acts naturally to strengthen the bird's resistance against infections and illness. Dosage: 1 teaspoon per gallon of water. A very effective capsule formulated in Belgium to speed up recovery and condition of race birds - especially on very tough races. Upon return from a hard race, administer 1 capsule. If overnight basketing, 1 pill the night before. If 2 day shipping, 1 pill 4 hours before basketing. Cleanses the system of toxin poisons and inhibits infectious organisms. Aids in assimilation of carbohydrates, amino acids, vitamins and minerals. A must when birds return from races and need to race repeatedly week after week. Recommended use for racing: Start two weeks prior to first race, use 7 days in a row. Then continue use on day of return from race. This tea is a fine powder. Designed specifically for pigeons. Simple to prepare and leaves no residue in the water. To prepare, use a microwave: boil water in a plastic bottle we provide, mix in level tablespoon of tea and shake, place lid on bottle and let set for 10 minutes. Then pour this concentrate into drinker and fill with additional water to make 1 gallon. 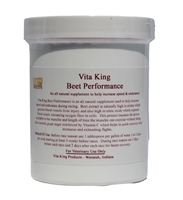 Vita King Beet Performance is an all natural supplement used to help increase speed and endurance during racing. Beet extract is naturally high in nitrate which protects blood vessels from injury and also high in nitric oxide which expands blood vessels increasing oxygen flow to cells. This process increases the power available to the muscles and length of time the muscles can exercise without tiring. Method of Use: Before race season use 1 tablespoon per gallon of water 1 or 2 days per week starting3 weeks before races. During race season use 3 days before each race and 2 days after each race for faster recovery. An amino acid compound applied directly on feed. Amino acids are essential in the body's process of forming proteins and building tissue. Can be used with Ornilevuro Brewer's Yeast. To use: 1 tablespoon to 2 lbs. of feed usually the day before shipping the race. From Peeters Products in Belgium. Used with the race team by mixing on the feed. To use: mix 2 tbsp. to 2 pounds of feed. Can be used with Vita King Brewer's Yeast or Ornilevuro Brewer's Yeast. Use the day before shipping the race. Formulated by veterinarians to aid and control respiratory problems and eye colds. To use: drop in each eye and nostril for 4 days. Electrolyte liquid used to combat dehydration in the birds especially in periods of extreme heat. Very beneficial in preparing birds for races during summer months, particularly the distance races. Also beneficial for the breeders and stock birds that may be raising youngsters in summer. During race season: use day before race, 1 tsp. per quart of water. Also the day of return from race, 1 tsp. per quart of water. During training: in hot weather, 1 tsp. per quart of the return from toss. This item will ship in a Flat Rate Box for $13.35. Cost of shipping will be added in check out for this item. This grit is just phenomenal. Guaranteed - your birds will go crazy over it. AND seeing how this mineral helps improve your birds overall health is mind boggling. Use this mineral grit mixture during the race season. What you will notice the birds will stay in condition longer, the birds become more buoyant. It's the perfect supplement to add to your existing race program. Use it all week during racing. Use in a grit bowl or use it as a treat in a smaller gallipot. You can also mix it with the feed. Also excellent for the breeders. This grit mixture is the best we have seen in all of the US and Europe. Ingredients: seaweed grits, silex, calcium, oyster shells, stomach grits, loam, minerals, trace elements, breeding seeds, carrots, CU, FE, Zn, Mn, Do, L, Sc, Vitamins A, B1, B2, B6, B12, D3 and E.
From Belgium. Water soluble product formulated to help the birds rebound from exhausting races and bring the birds into condition for the upcoming race. Used the first 2 days after the race - 2 tbsp. per gallon of water along with the Vita King Nourishing Tea. A natural liquid supplement for pigeons that increases the bird's speed and endurance. Made from concentrated beet extracts. The micro-nutrients in the beet extract are betanin, betain, iron, resveratrol and phytosterois. Numerous studies on athletes have clearly shown that nitrate rich beet juices decrease the athlete's muscles oxygen needs and increase their exercise and endurance. The latest technology for athletes now available for our racing pigeons. Dosage: 2cc (ml) per 1 liter of drinking water, 1 or 2 days per week starting at least 3 weeks before a race and each of the last three days before the race. Also, 3 days after the race for faster recovery. Treatment for coccidiosis, canker, respiratory, worms plus Vita Pro Combo. Combination of amprolium for coccidiosis, Ridzol S for canker, tylosine for respiratory infections, levamisole for worms and Vita Pro Combo. Dosage: 2 level teaspoons (15 grams) per gallon of water for 5 days. Stabilizes the health and form during transit to race release. A concentrated combination of amino acids, Vitamin E, Vitamin B12 and other essential vitamins. During race season: use the day before shipping, 1 rounded teaspoon (10 grams) per gallon of water. Formulated by veterinarians for respiratory treatment during the race season. Dosage: 1 teaspoon per gallon of water twice a week during the race season. Use the 2nd and 3rd day before shipping. Improves performance after heavy muscle strain and brings on top race condition and form much quicker. During race season, use on day of return from race. Dosage: 1 rounded teaspoon (10 grams) per gallon of water. Treatment for bacterial infections, gastrointestinal and respiratory tract. Provides therapy in parasite infections and prevents infectious diseases. A must for top performance in order to excel at 110% on race day. During race season, use 3rd day after race. Dosage: 1 rounded teaspoon (10 grams) per gallon of water. A simplified system designed to put your birds on top of the race sheet! Vita King has developed a system which has produced great results with both old and young birds for many years now. This is probably why we see many customers order the system year after year. The system consists of six products used during the seven days of the week and also consists of a feed and training schedule. How to use the products, the feed and training schedule are all outlined below. The six products are offered in a package price of $235.00 - which is a $30.00 savings from the individual price of each product. Click here to see how to use The Amazing 1-2-3 System!